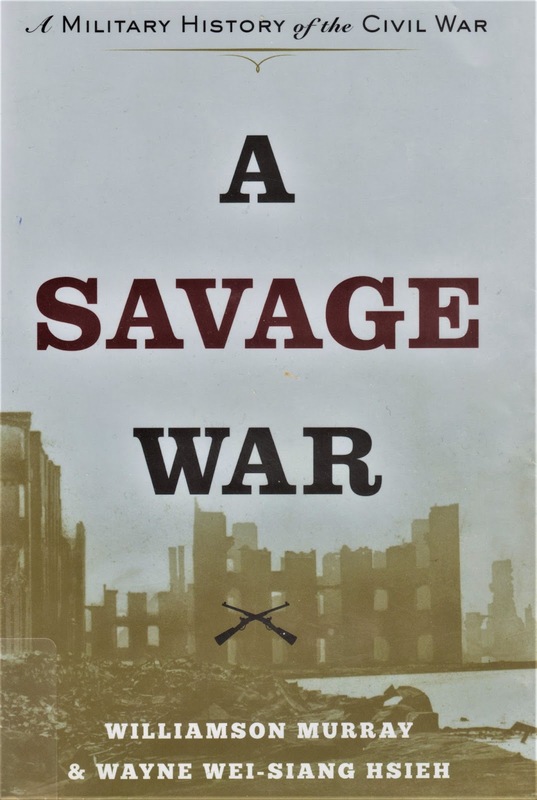 Williamson Murray and Wayne Wei-siang Hsieh, A Savage War: A Military History of the Civil War. Princeton: Princeton University Press, 2016. The authors provide a refreshing overview of the American Civil War through the lens of military history. They consider generalship, logistics, historical context and continued relevance. A few snippets are in order. "Of all the generals in the war [Ulysses S.] Grant is both the most interesting and the most difficult to discern, because behind his mask of simplicity lay an understanding of war that few generals in history have equaled." (page 534). A Savage War highlights Grant's success in the Western Theatre, as well as ideas he put forth that would probably have shortened the war, had they been approved. For example, he wished to send forces to seize Mobile, Alabama, and Raleigh, North Carolina, much sooner than finally authorized. It also emphasizes the dramatic Union successes in the coordinated 1865 campaigns, usually overlooked or underplayed by those with Confederate sympathies. A Savage War also takes a sophisticated approach to General Joseph Eggleston Johnston, "the great puzzle among the Confederate commanders." (page 539). "[O]nly Johnston seems to have had some glimmerings that defensive operations offered up substantial possibilities of success at the strategic level." (page 547). And: "In the end Johnston proved the greatest master of defensive warfare -- but that skill put him out of touch with the larger culture of Southern white society." (page 540). There's much more ground to cover -- perhaps starting in a future post. Bottom line: if you want to catch a glimpse into modern (and timeless) military thinking as reflected through the American Civil War, A Savage War is worthy of your attention. The American Civil War reminds us that Americans, when driven into a frenzy, are quite adept at killing each other, and they (aka we) always have been. I'm just writing a story set in the immediate post civil war period so this would be good research material for me.